Product prices and availability are accurate as of 2019-04-13 23:25:40 EDT and are subject to change. Any price and availability information displayed on http://www.amazon.com/ at the time of purchase will apply to the purchase of this product. 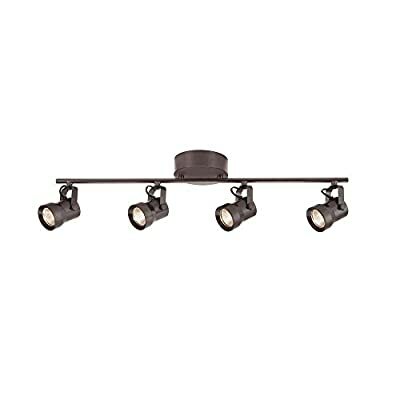 Hampton Bay LED 4-Light Bronze Fixed Track Lighting Kit, features with Straight Bar and Metal Shade. LED Heads pivot and rotate to direct light where it is needed most. Dimmable, energy saving using 21-Watt, while delivering performance equivalent (4) 35-Watt traditional halogen lights. LED integrated module, maintenance free, no need to replace bulb, saving time and cost. Good choice for decorative location like living room, kitchen, bedroom and other rooms that high-end LED fixture required.